The historic Agreed Statement between Anglican and Oriental Orthodox theologians on the Procession and Work of the Holy Spirit has been published. The statement was signed last October after lengthy discussions by members of the Anglican Oriental-Orthodox International Commission (AOOIC). It was published at this year’s meeting of AOOIC, which took place last week in Lebanon. The agreed statement is part of a series of work which has helped to heal the oldest continuing division within Christianity, a schism that goes back centuries. At the core of Agreed Statement is the controversial Filioque clause – appended to the Nicene Creed by the Latin Western tradition causing a schism between the Oriental Orthodox Churches and the western Churches that was inherited by the Anglican tradition. The clause says that the Holy Sprit proceedes “from the Son” (Jesus) as well as the Father. The Agreed Statement says that Anglicans should omit the clause. At this year’s meeting, the Coptic Archbishop of London, Archbishop Angaelos, was unanimously elected as the Oriental Orthodox Co-Chair – a move welcomed by the Anglican members. 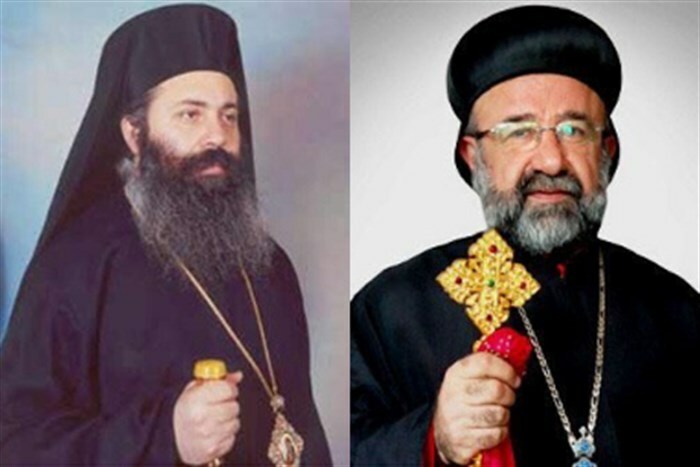 Two bishops of Aleppo abducted in April 2013, Metropolitan Mor Gregorios Youhanna Ibrahim of the Syriac Orthodox Church, and Metropolitan Boulos Yazigi of the Greek (Rüm) Orthodox Church of Antioch, continue to be missing. The Commission remembered the two in their prayers. Metropolitan Mor Gregorios Youhanna Ibrahim, of the Syriac Orthodox Church, and Metropolitan Boulos Yazigi, of the Greek Orthodox Church of Antioch, were kidnapped in Aleppo in April 2013. Photo: Archbishop Angaelos / Coptic Orthodox Church (via Twitter). They heard about the “present critical situation of Christians in the Middle East”, particularly in Iraq and Syria, from Patriarch Mor Ignatius Aphrem II, Patriarch of Antioch and All the East, and Catholicos Aram I of the Holy See of Cilicia. And in an expression of the global nature of Church communions, the communiqué said that members of AOOIC “recognise that it is no longer a question of speaking of the Churches of ‘the East’ or of ‘the West’, as we have become truly global communities. The Procession and Work of the Holy Spirit can be purchased from the Anglican Communion online shop.